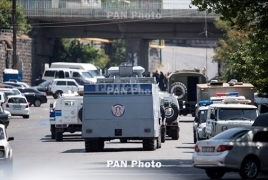 PanARMENIAN.Net - The armed group that seized a police HQ in Yerevan is ready to respond to the demands of the National Security Service by 7:00 pm local time, one of the members of the group said Tuesday, July 19. The group stormed the police department on Sunday, taking everyone inside hostage. The gunmen are members of the Sasna Tsrer movement. One police officer was killed, and three more were wounded in a shootout that broke as the members of the group hit the gates of the police department with a Ural track. Several captives have been set free so far. The group demand the release of Jirair Sefilian, the founder of the Founding Parliament who was arrested on June 20, as he and a group of people had planned to seize premises and communication facilities, including the Yerevan TV tower. “I have been participating in negotiations between the NSS and the representatives of Sasna Tsrer group, the one that is holding the police building in Erebuni,” Novosti Armenia cited Alek Yenigomshyan as saying. Yenigomshyan, however, failed to unveil the main requirements that the NSS has put forward. According to Yenigomshyan, after reaching a preliminary agreement, as well as securing the gunmen’s readiness to consider the authorities' proposals, everyone inside the police premises was deprived of all kinds of communications. “It is impossible to negotiate in such conditions; unless communication is restored in the building within half an hour, we’ll consider negotiations unilaterally ceased on the authorities’ behalf,” Yenigomshyan said. According to him, the members of the group coordinate their actions with Sefilian. The situation at the scene is calm, with no incidents registered throughout the night.